The inter-Korean Summit ended with the success of the declaration. Now the hard work really begins, Sang Hyun Lee writes. The historic inter-Korean summit ended with success, at least, so far. President Moon and Chairman Kim announced the ‘Panmunjom Declaration for Peace, Prosperity and Unification of the Korean Peninsula’ in a festive mood after the summit meeting. The Declaration consists of three parts: first, improving relations to seek shared prosperity and self-reliant reunification; second, reducing military tensions between the two Koreas; and third, establishing lasting peace on the Korean Peninsula. Before the summit, the South Korean government briefed that the meeting would focus on three key agendas: denuclearisation, promoting peace, and improving inter-Korean relations, roughly with an emphasis in that order. 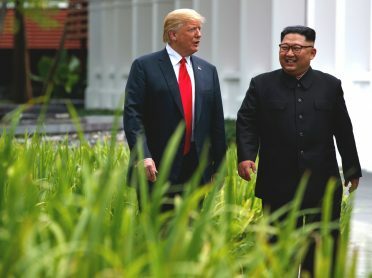 The Panmunjom Declaration, however, is drafted in an exactly reverse order, allocating greater focus on inter-Korean relations and reducing military tensions. Denuclearisation was mentioned only as a small part at the end of the declaration. This is surely disappointing, but nevertheless it can be viewed as a meaningful first step along a long and arduous path of denuclearising North Korea. There remain a few concerns. First of all, even though the declaration said that “South and North Korea confirmed the common goal of realising, through complete denuclearisation, a nuclear-free Korean Peninsula,” it is yet to be confirmed whether ‘complete denuclearisation’ is the same thing as CVID (complete, verifiable, irreversible denuclearisation). This will be the primary question to be addressed at the upcoming Trump-Kim summit in June. Also, does the phrase ‘nuclear-free Korean Peninsula’ include withdrawing US (nuclear) extended deterrence provided as part of the Korea-US alliance? Despite the lofty rhetoric and fanfare, we don’t yet know Kim Jong-un’s real motivation to have denuclearisation talks. The future ahead is like a complex three-dimensional game. On the inter-Korean dimension, genuine rapprochement and improvement of the relationship should be discussed. On the US-North Korea dimension, both leaders should come up with a detailed plan to exchange CVID and provide a regime security guarantee. On the North Korea-international community dimension, lifting sanctions and a verification/monitoring mechanism must be discussed. Progress on these three dimensions should proceed in tandem, roughly at a balanced pace. We are entering a completely uncharted course on the North Korean nuclear issue. Can we succeed this time? As President Trump tweeted, only time will tell. Sang Hyun Lee is a senior research fellow and Vice President for Research Planning at the Sejong Institute in Korea.